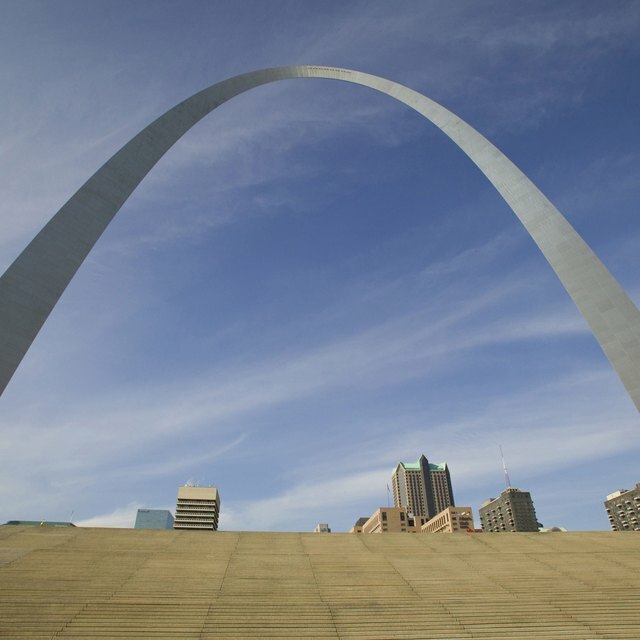 The St. Louis Gateway Arch is built in the shape of an upside-down catenary curve arch. So is the dome that Brunellashi designed for the cathedral in Florence, Italy. The measurements for a catenary curve arch can be derived using a mathematical formula, but since the times of the pyramids, builders have eye-balled the curve using a hanging chain. That works because a catenary curve is the shape that forms when a chain hangs suspended from either end-point. Arches, suspension bridges, and domes that use this shape are strong enough to support their own weight. Here are directions for making a catenary curve arch using clay. Create a pattern for the catenary curve arch. First mount the white poster board on a bulletin board using the thumb tacks. One person should hold the chain in front of the board. It is very important that the two ends of the chain are at the same height. A second person should shine the flashlight directly towards the chain. It should cast a shadow in the shape of the curved necklace onto the poster board. The third person should trace the curve of the shadow with the pencil or marker. The action of gravity on the suspended chain forms a perfect catenary curve. Turn the poster board upside-down to make the catenary curve that you drew face up like an arch. This arch will be the guide for your catenary curve arch. Roll the modeling clay into a snake that is 18 inches long, the same length as the chain you started with. The snake can be as thick as you want. The endpoints of the clay snake should be even enough to stand on the ground or the table to make the feet of your catenary curve arch. Hold the poster board upright and perpendicular to the table where you are working so that the catenary curve is contiguous to the top of the table. Another person should position one end of the clay snake on the table in front of the bottom of the left side of the drawing of the catenary curve. Following the drawn line, bend the clay snake up and towards the left until the entire clay snake matches and is parallel to the drawn curve. Place the right end of the clay curved arch on the table. Decide whether you want to allow the clay catenary curve arch to dry or whether you want to cut it into clay bricks that can dry and be reassembled into a free standing catenary curve arch. If you decide to divide the clay arch into bricks, use a sharp knife to slice each brick. Lesley Barker, director of the Bolduc House Museum, authored the books "St. Louis Gateway Rail—The 1970s," published by Arcadia, and the "Eye Can Too! Read" series of vision-related e-books. Her articles have appeared in print and online since the 1980s. Barker holds a Bachelor of Arts in sociology from Washington University and a Master of Arts in Teaching from Webster University. Barker, Lesley. "How to Build a Catenary Curve Arch." Sciencing, https://sciencing.com/build-catenary-curve-arch-5024601.html. 24 April 2017.